Delgado’s Simulator Suite is comprised of three interactive Full Mission Bridge simulators. Simulators are used for Wheelhouse Proficiency Management classes to provide scenarios on navigating waterways on different types of vessels. Simulators can be programmed to run three vessels at the same time, so that students in all three wheel houses can communicate and interact with each other. Both conventional and Z-Drive controls can be used in the training. In the past 12 months, the Delgado Maritime & Industrial Training Center has trained a total of 4,952 students in a variety of Fire Fighting, Safety, and Radar Navigational courses. With regard to Simulation classes specifically, it ran 71 total classes. Courses included all levels of Wheelhouse Proficiency Management, Z-Drive Training, and Towing Assessment Programs. The main thrust of its business is Domestic Inland Waterways and Offshore Oil & Gas. 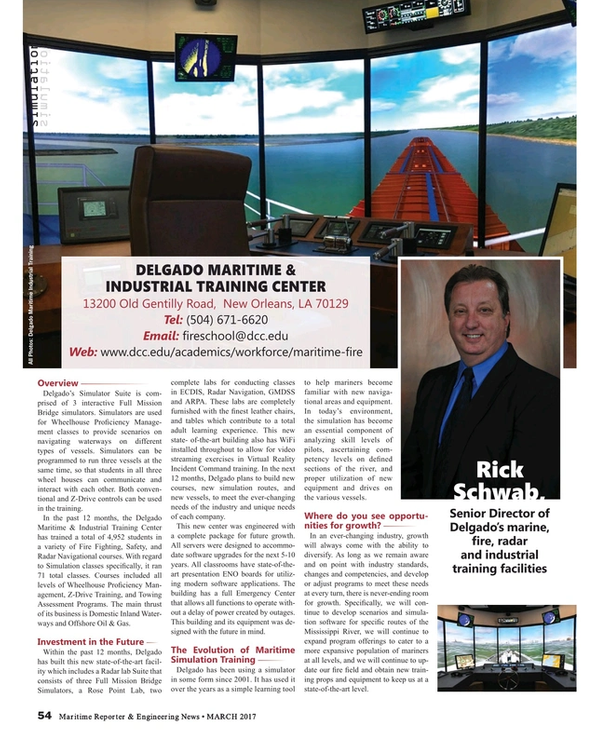 Within the past 12 months, Delgado has built this new state-of-the-art facility which includes a Radar lab Suite that consists of three Full Mission Bridge Simulators, a Rose Point Lab, two complete labs for conducting classes in ECDIS, Radar Navigation, GMDSS and ARPA. These labs are completely furnished with the finest leather chairs, and tables which contribute to a total adult learning experience. This new state- of-the-art building also has WiFi installed throughout to allow for video streaming exercises in Virtual Reality Incident Command training. In the next 12 months, Delgado plans to build new courses, new simulation routes, and new vessels, to meet the ever-changing needs of the industry and unique needs of each company. This new center was engineered with a complete package for future growth. All servers were designed to accommodate software upgrades for the next 5-10 years. All classrooms have state-of-the-art presentation ENO boards for utilizing modern software applications. The building has a full Emergency Center that allows all functions to operate without a delay of power created by outages. This building and its equipment was designed with the future in mind. Delgado has been using a simulator in some form since 2001. It has used it over the years as a simple learning tool to help mariners become familiar with new navigational areas and equipment. In today’s environment, the simulation has become an essential component of analyzing skill levels of pilots, ascertaining competency levels on defined sections of the river, and proper utilization of new equipment and drives on the various vessels. Where do you see opportunities for growth? In an ever-changing industry, growth will always come with the ability to diversify. As long as we remain aware and on point with industry standards, changes and competencies, and develop or adjust programs to meet these needs at every turn, there is never-ending room for growth. Specifically, we will continue to develop scenarios and simulation software for specific routes of the Mississippi River, we will continue to expand program offerings to cater to a more expansive population of mariners at all levels, and we will continue to update our fire field and obtain new training props and equipment to keep us at a state-of-the-art level.